On February 7, 1919, the Mighty Signal’s first paper published. “It was the end of World War I and life, and invention, were erupting with a jubilant fierceness,” writes Time Ranger John Boston. 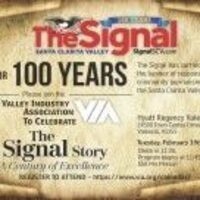 For 100 years, The Signal has carried the banner of responsible community journalism in the Santa Clarita Valley. Tuesday, February 19, 2019 at 11:45 a.m.
at the Hyatt Regency Valencia. Welcome Signal notables from the past as they join Signal Owner and Publisher Richard Budman on stage for a panel discussion of the Signal’s rich history and view the first public showing of an exclusive video presentation produced by SCVTV.